Nature2 is a water purification technology for swimming pools and spas that gives the purest, clearest water imaginable. Models are available for in-ground and above-ground pools. Nature2 products use the same minerals found in nature to trap bacteria and algae. Because Nature2 traps bacteria and algae, less harsh chemicals are needed to keep your pool or spa water balanced. By using Nature2, you reduce the level of harsh chemicals between 50% and 80% versus the harsh chemical levels you would need without Nature2. Nature2 water is brilliantly clear. Chemically treated water can be harsh and unpleasant. Nature2 is the only purifier that guarantees all this. 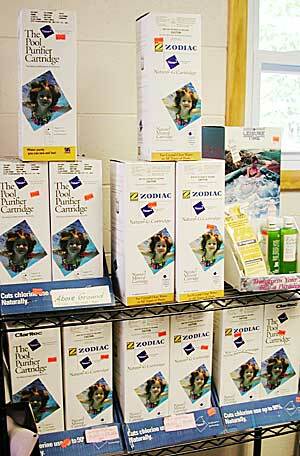 Guaranteed -- Less chlorine, less chemical use, fewer chemical hassles. Guaranteed-- No red, burning eyes, irritated skin or discolored hair. Guaranteed -- Less time necessary for pool maintenance. Guaranteed -- Nature2 will never create pool stains. Guaranteed -- Easy to use. Guaranteed -- Annual cost equal to or less than your current treatment. Guaranteed -- A more refreshing, highly enjoyable swimming experience.  the #1 Chlorine Alternative according to an independent pool industry survey.  installed in over 180,000 pools in the U.S.
 carried by more than 5,000 pool dealers nationwide, and growing.  endorsed by the 3 largest pool builders.  using breakthrough technology protected by 17 worldwide patents and 20 patents pending. Conventionally "sanitized" pool water is harsh and unpleasant. Nature2 water is brilliantly clear and soft.  Once you swim in a Nature2 pool, you'll never want to swim in a pool without it!  No electicity, no moving parts. We are offering rewards for referrals that lead to new pool sales. Anyone who is the source for a pool sale that results in a new pool installation/construction qualifies. Click here to see details. Sorry, the store will reopen in mid- or late-April. You may call for sales or service requests at any time! Soon it will be time to schedule pool openings! © Copyright 2003 - 2019 J.C. Pools, Inc.